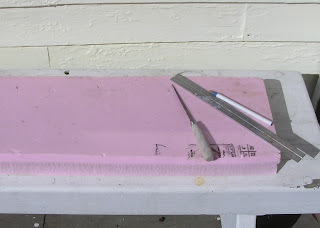 Okay, here's something I never do, because I fear focus on quantity diminishes quality; but I am going to try and throw enough to fill my bisque kiln, today. The reason is, I just noticed that a piece that absolutely must be finished by April 1st, didn't make it into the yesterday's bisque. As Bugs Bunny would say, what a maroon! My kiln is only about 16 cf 27 cf (obvs. I wasn't a math major!) so there's no problem throwing that much; it's just finding time to trim, handle, and decorate all those pots, and still have time to get them dry and bisqued before the next glaze firing. I won't sacrfice quality or style, and, honestly, it may turn out that they don't get done. I did not overspeak when I said this one piece must get done; but I have other options. 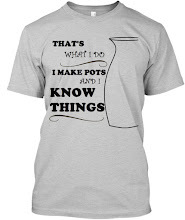 No one would mind if I added one piece to Portland Pottery's kiln, and they bisque once or twice a week. But once the idea occured to me, it seemed like a good one, as a kind of research project. How much can I make and finish (wetwork, anyway), while preserving my somewhat decorative style, in a single week, if I really push? It seems to me this would be a good piece of information to have, for business planning purposes. And you can help! If you see me on Twitter, or noodling around on Facebook, give me a nudge. Just, you know, a gentle, "Aren't you supposed to be throwing?" I have ADD, so I do tend to get distracted. So what am I doing here? Up, up, out of your PJs, into the studio! Right, then -- I'm off. A beautiful day can be a kind of a burden, as I almost feel guilty for spending it inside. On the other hand, if I go outside and just noodle around in the garden, I feel guilty for not getting my studio work done! Can't hardly win. It's too early to move into the summer studio, but I did find an outdoor clay project for today. 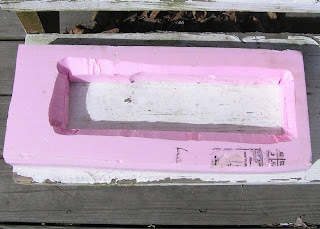 I've been wanting to make some slump molds for slab building out of some leftover insulating foam I have kicking around the house. 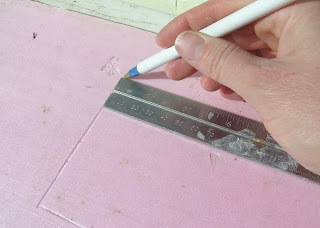 It's a good material to use, as it is cheap, waterproof, and can be cut in any shape; although the cutting was the hold up. 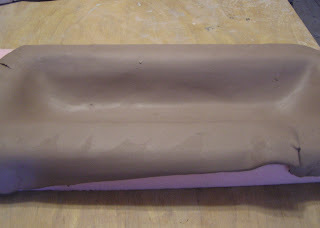 The molds I had seen had very rough edges, requiring a lot of finishing work at the leatherhard stage. A student of mine (God Bless my students -- I learn so very much from them!) who usd to be a set designer suggested cutting it with a hot wire, to get a nice clean line. The wasn't feasible (for me -- but I'd love if someone tried it, and let me know the results!) but a hot fettling knife, now, that I can do. This is strictly an outdoor project, as the fumes generated by melting the insulating board are nasty. Draw the shape you want beforehand. Conveniently, I am firing a bisque today, so I just stuck the blade of the knife right into the flame to heat it up. 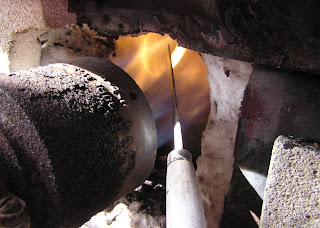 It doesn't take long - 10-15 seconds -- and if the metal is glowing, the blade is too hot. The foam will melt before the knife even touches it. The knife when it first comes out of the flame, will cut more quickly than you expect: even faster than a hot knife through butter! But it cools quickly, and there is a relatively short period between "too hot to control" and "too cool to cut cleanly." Here is my first effort. It looks a little sloppy but made a good mold. I think with a little practive I can get a cleaner cut. Notice the beveled edges. 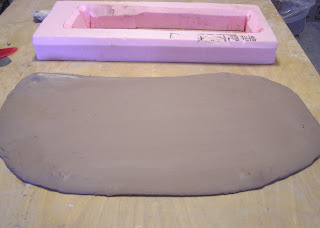 These are important, because the slab of clay is going to stretch at the edges of the mold. 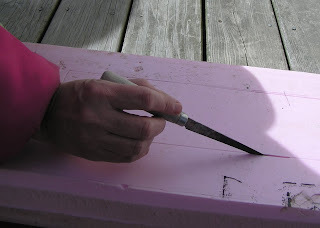 The bevel keeps the stretch from being too extreme, and tearing or (later) cracking the slab. 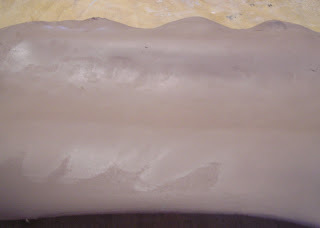 After draping the slab over the mold, pick up the two together and drop onto the (porous!) table top. 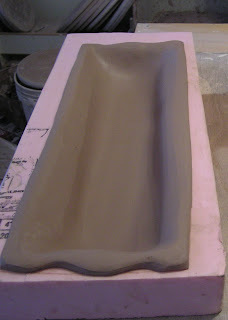 This will cause the slab the slump down into the mold. 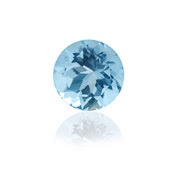 March's birthstone, the aquamarine, is said by mystics to have countless positive effects on the wearer. Most auspiciously, it is used to treat those in whom procrastination is an affliction! Not that I know anyone like that -- do you? Fire one soda & one stoneware kiln. Whew! March is gonna be madness, alright. I am tired already. Aquamarine is also associated with The Hanged Man of the Tarot deck, who encourages seekers to turn away from material things and seek solitude. Sounds like a perfect time to quit the IPTOG.